Enterprises build, staff and maintain Network Operations Centers (NOCs) across major geographies for proactive monitoring, coordinated response and continuous visibility. Global NOCs manage the availability and performance of critical IT services with ‘anytime, anywhere’ support for better situational awareness and greater efficiency. In a global NOC, you’ll have internal employees accessing, monitoring and troubleshooting enterprise services across different locations. You might also have external managed service providers and technology vendors offering dedicated or on-demand incident support across your hybrid infrastructure stack. How do you maintain secure and scalable operations across internal teams and external service providers? How do you establish root cause(s) for a critical outage in a globally distributed IT environment? How can you effectively train and share best practices across different technology teams? If you have NOC teams working out of Palo Alto, Dublin and Manila, it’s not easy tracking who’s accessing your infrastructure and what changes they’re rolling out at any point. During a service disruption, it’s also a herculean task establishing if an employee (or consultant) actually fixed the issue or caused the incident in the first place! Access a wide variety of compute (Windows and Linux servers) and network (switches, routers, firewalls and load balancers) infrastructure through remote consoles. Automatic recording of all administrator sessions (including every mouse click and keystroke) for playback. Secure and authorized access using role-based access controls and stored credentials. 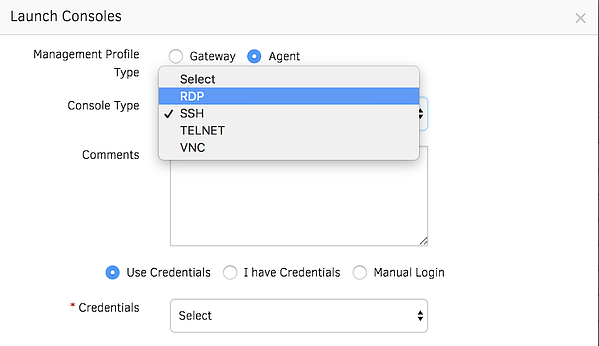 Workload access through a wide variety of protocols like Secure Shell (SSH), Remote Desktop Protocol (RDP), Telnet, Virtual Network Computing (VNC), and Remote Shell (RSH). Figure 1 - Launch remote consoles for secure global infrastructure access. Remote consoles help you reduce mean-time-to-resolution with on-demand secure access for staff and partners. You can train new employees with video playback for incident triage so that they don't need to escalate to senior staff all the time. Finally, you can access session recordings for the last six months for operational compliance. #1 - Manage Access With Defined Time Limits. Do you have vendors performing one-time activities in your environment? Do you wish to stop providing partners with permanent access to your IT infrastructure? OpsRamp lets you manage infrastructure access for third-party vendors by creating specific access time intervals (30 minutes, 60 minutes, or 120 minutes). Deliver on-demand access to your infrastructure and automatically withdraw access after the time window elapses. And, since these partners will connect to your infrastructure through remote consoles, you can capture all actions performed by them. Figure 2 - Create specific windows of time for third-party access. #2 - Root Cause Analysis. Did you discover that different teams have recently accessed an application, which has just suffered a major outage? How do you quickly figure out what caused this disruption? Instead of combing through thousands of log files to pinpoint incident root cause, use remote consoles for a complete visual audit of all your staff actions on that application. You’ll gain a clear picture of what actually happened with keystroke session recordings and resolve issues faster with rich event context. Figure 3 - Provide auditable, event context for critical IT systems. #3 - User Training. Are senior technical staff working on support escalations all the time? Is your 'first call resolution' metric taking a hit because your distributed teams lack the training to solve a customer request? Remote consoles offer a cost-effective way to train globally distributed teams by recording and replaying the incident triage process used by your most experienced team members. Upskill your newest team members with session recordings so that they can restore services without talking to your experienced staff. Figure 4 - Deliver training sessions for new staff with video playback. Learn more about our remote access and audit capabilities. Read our Digital Operations Command Center whitepaper to know more about IT Operations as a Service. For a compliant and secure IT infrastructure, talk to an OpsRamp solutions consultant today.